Buying A Complete Tool Kit – Budget vs Quality? In the past it was usual that when someone entered a trade or became an apprentice they would build up their tool case over a period of time. A professional tradesman needs top quality tools and if you are training to become an electrician for example the costs can be pretty high. But as the world has progressed and technology has become more complex it is sometimes necessary nowadays to have a wide ranging toolkit right from the word go. One company in particular has come up with a solution to this with the availability of a range of toolkits which are not only affordable but are of top quality and should last many many years if looked after properly. CK tools are a German company who have been manufacturing top quality tools for over 100 years so they really do have a proven track record for quality and reliability. For electricians they offer the 595003 Professional Premium Electricians Tool Kitwhich covers just about everything a Electrician could need from entry level to the most experienced of Electrical Engineers. The kit includes Combicutter3 sidecutters with cutting Jaws with CK optimised geometry for unsurpassed cutting performance and special C60 alloy steel for exceptonal strength and durability.There are also a range of Dextro screwdrivers which are fully VDE Approved and individually tested to 10,000volts for safe live working up to 1000volts. 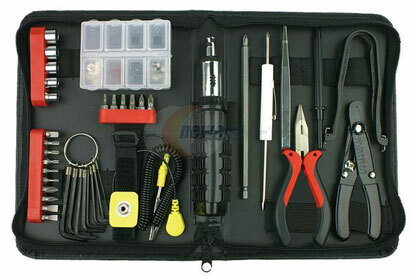 All of this comes in my favourite technicians toolcase the Magma MA2630. Made in a durable polyester material it has great looks and is very comfortable to carry due to its padded carry handle and wide shoulder strap. Incidentaly the CK in CK Tools stands for Carl Kammerling who was the founder of the company in Wuppertal, Germany, in 1904. The company have been producing top quality tools for sale throughout the world ever since. Above all, when it comes to purchasing tools, you simply cannot opt for anything other than the best. If you’re using tools for a trade rather than DIY, as far as we’re concerned, you need tools which are reliable and built to last and, in many instances, that does mean paying a little bit more than budget tools however quality tools are worth every penny!